Photo Above: Students from East Middle School measure water chemistry on the banks of restored Silver Bow Creek just west of Butte. 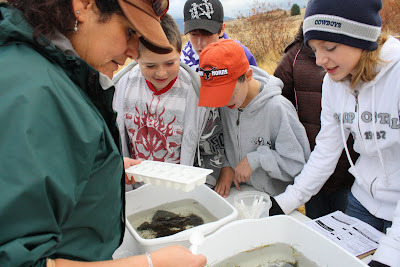 Around the Clark Fork, our Fall school middle school visits are in full swing. We started in September at Drummond School and just completed our East Middle School visits in late October on the icy banks of Silver Bow Creek. Our last trip for the season is Butte Central High School in November. We recently revised our curriculum in order to expand our history and bioindicator lessons, as well as give students more opportunity to practice field techniques and become comfortable with our new datasheets. We have also included additional activities to engage students in the classroom. New activities include making a watershed using paper, markers and water in order to visualize how water flows within a watershed. Another activity that is very effective in helping students with the field component is an in-class review of how to correctly identify vegetation structure (ground cover, understory and overstory) and how to identify aquatic macroinvertebrates. Finally, the in-class field practice has been expanded to include a practice vegetation assessment in addition to practice with GLX water quality meters. 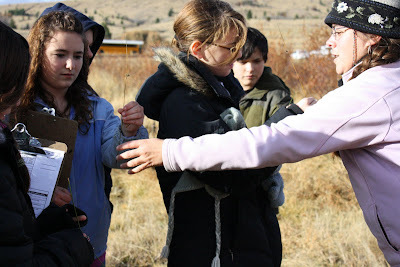 Photo Above: Lorna McIntyre from CFWEP assists students in identifying the riparian vegetation of Silver Bow Creek. CFWEP teachers around the Basin have responded enthusiastically to the revised curriculum. Most importantly, the students appear to enjoy the expanded activities. Students also seem to conduct their field trip data collection with more confidence. It is quite rewarding to hear the students using scientific terminology when discussing their field observations and experience. Photo Above: CFWEP’s Arlene Alvarado helps students collect and identify stream insects in order to assess the health of Silver Bow Creek. Before we know it, the Spring field trip season will be upon us. 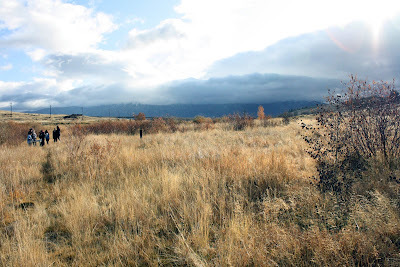 If you are interested in volunteering for a Spring field trip, contact Arlene Alvarado, CFWEP Field Coordinator, at (406) 496-4862 or aalvarado@mtech.edu for a full schedule of volunteer opportunities.